Cane Pro 4 Rollers is the most powerful machine which comes with Italian Gearbox and 1.5 HP heavy duty motor & World's best Bearings. 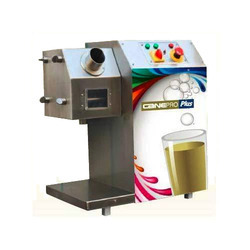 CanePro Star is a compact yet powerful sugarcane juicer that can deliver high performance. The juicer features a 0.5 Hp motor, a gearbox from Motovario, Italy and diamond knurling rollers which helps to extract 95% of the juice in a single pass. It can crush up to 1.5 kgs per minute and so serve up to 4 glasses a minute measuring 250ML. The compact space saving design and easy-to-use features makes this the most preferred juicer among juice shops and restaurants. CanePro Plus 5 Rollers Sugarcane Juice Crusher is a compact yet powerful fully automatic sugarcane juice extractor with 5 rollers that can deliver high crushing performance. the machine features a 1.5 hp motor, a gearbox from motovario, italy, removable and interchangable diamond knurling rollers which help to extract 99% of the juice in a single pass. 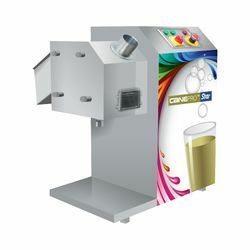 the compact “space saving” design and “easy to use” makes this machine most preferred among juice shops and restaurants. 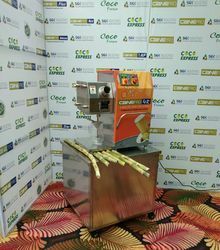 Cane Pro Ace Sugarcane Machine with Instant Chiller is the most powerful machine which comes with German Gearbox and 1.5 HP heavy duty motor. 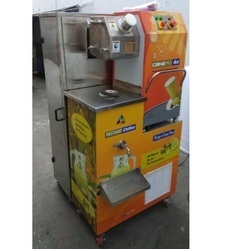 Looking for Sugarcane Juice Machines ?